So I made a cheap desk. 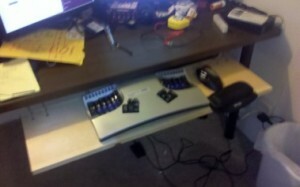 Then I needed a keyboard tray. So I built one. I simply used a piece of 1×12 hung underneath the desk by threaded rod. The desk top is hollow (well mostly, it’s got some papery junk in it) so the threaded rod is attached to the under side using toggle bolts on the inside of the desk and a washer and nut on the outside. This was not as strong as I hoped; the holes had to be so big to allow the toggle through that there was a lot of play. But once the nuts where tightened down it was OK. 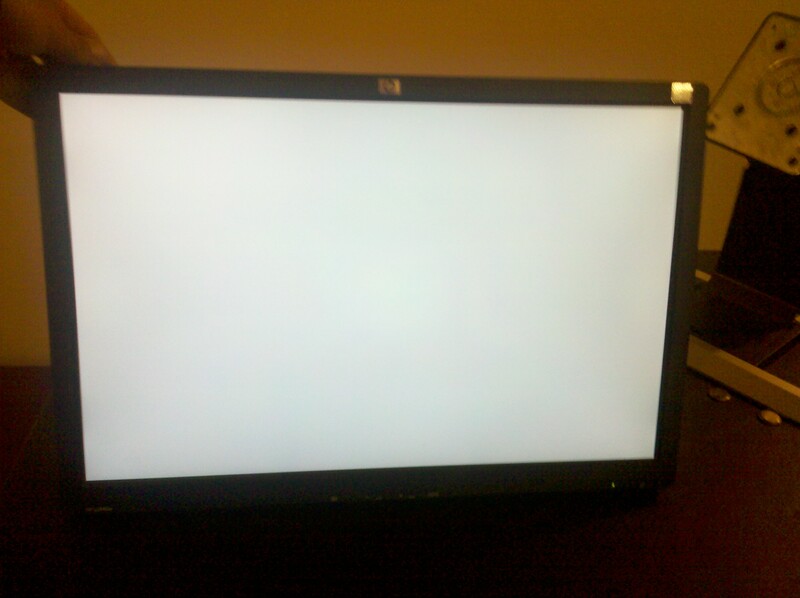 So when my monitors got to me in Portland one of them only displayed solid white when plugged in. 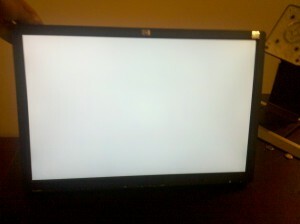 I knew it was the monitor because it would only display white even when it was not connected to the computer and should have displayed the “check cable” box. I also deduced that the issue was only with the LCD and not the backlight because it still went and off in the way it should. It just only displayed solid white instead of the image it should. 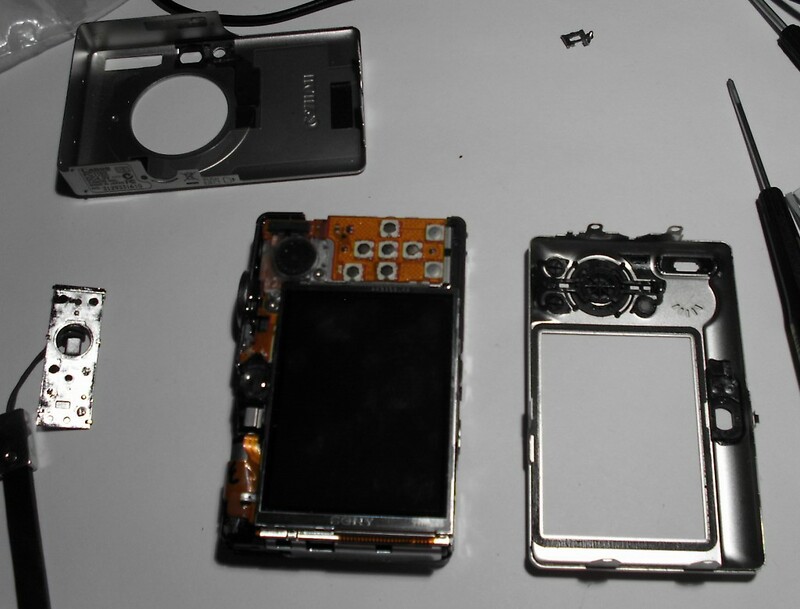 Also it was a clean even white so I was sure the LCD it self was intact. Therefor it must be the controller or the cable. And I guess the cable. In retrospect this was probably only because I could fix a cable. 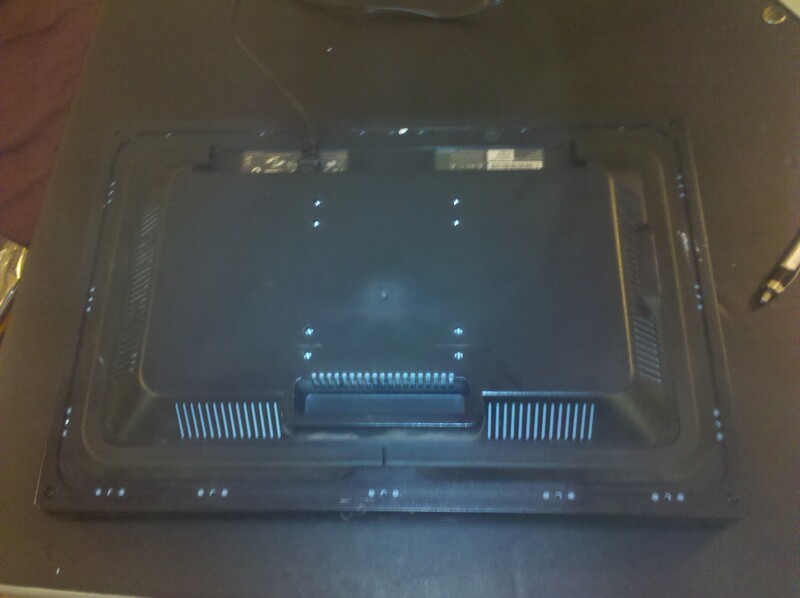 So I decided to take apart the monitor and try to remount the cable. I want to apologize up front for not having pictures of the whole process. I started taking them at the beginning and then forgot once I got going because I was so focused on trying not to break anything. So I have no pictures. So my family has a SD600. It works great. But the mode switch broke so you could not switch between photo, video and viewer mode. I guessed that it would be fixable and I was right! 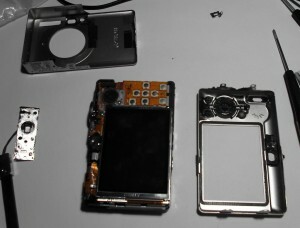 The camera in parts. 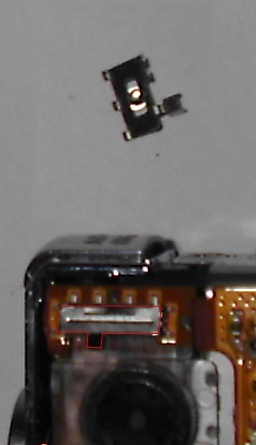 Most of the parts are obvious, but the little metal piece and screw in the upper right of the image is the clip that connects the part that the user slides with the internal switch mechanism. 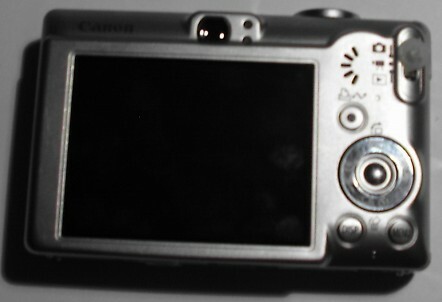 It was relatively easy to take off the case of the camera to access the switch. I read this page by Arnoud and it has decent directions and great pictures. I only did the first step (taking off the case) and there was one catch (literally). The instructions did not mention that there is an internal clip just above the view finder (sorry I forgot to photograph it). Once you take out all 6 screws you will need to work a small screw driver in between the front half of the case and the rear half and bend the front half away from the body of the camera and pull the from half off. It should pop off. The rear should then come off easily. The actual internal switch turned out to point sideways and be connected to the external part that the user moves by a little metal plate on the inside of the case that interlocks with the switch and is screwed to the external switch throw a hole in the case. The switch is outlined in red. The little metal plate and screw is above. I was able to screw the screw throw the plate and the case into an external piece as it was designed. However the external piece I used was just a little white nylon stub (one of the ones used to hold IC in tubes). I had to put a hole in it so that the screw could catch in the plastic and cut it’s own threads. I did not have a small enough drill bit (it would have needed to be like 1/32″ or less) so I used a sowing needle. It was too small for the chuck of the drill so I used some masking tape to give it more bulk. Since the needle doesn’t actually remove any material (it just compresses it out of the way) I needed to use a larger needle than I expected and it took some time and fiddling to get the screw to catch. Once I had my external “switch” finished I screwed the screw through the plate and the case into the nylon stub. I made it to tight at first; it just needs to be tight enough to hold everything in place and loose enough to slide easily and to avoid bending the metal plate (it’s really thin). The new switch works. But is sticky and feels really weird. But I was able to take and import pictures and video which is more than I could do before, so I’m happy. Also I think I could get a longer tiny screw and add a piece of flat plastic between the nylon stub and the case. This would stop the stub from sticking against the case. Note the new "switch" in the upper right. I’m a big fan of Android. I have been for a while. However I have yet to get an Android phone because I have not seen one that seems worth it. However the advertising for the Droid is so good that it hooked me. I really want one now. Which is impressive since advertising doesn’t usually draw me in. However I have a bad feeling that the rumored release date of Nov 1st may actually be just an official announcement date. I think this may be the case for a couple of reasons. All the pictures of the device appear to come from one place (Boy Genius Report). Android 2.0 has not even been released yet in any form. And all the pictures of that are also from Boy Genius Report. Not that I distrust them (I don’t know anything about that site), but single points of information are always iffy. People often mistake my Sony Reader 700 for a Amazon Kindle, and at that point I feel obliged to explain why I didn’t get the Kindle (which costs the same and has the EVDO link and such like). I usually site freedom. As much as I usually hate Sony (and their rootkits), the Reader is actually fairly flexible. When you plug it into a computer it shows up an external harddisk and you can put whatever files you like on it. It will read/play any files that are in a format in understands. The Kindle however is really designed to only accept content from Amazon and the EVDO link to Amazon is actually a liability because it allows Amazon to control it remotely without your consent. So they could to things like removing or editing books you have put on the device. People I’ve said this to have been doubtful. One at least said, “Why would they ever do that?”. I didn’t have a specific answer. But now it’s a moot point because not only can they do it but they have done it. Amazon removed copies of 2 book from Kindle remotely without OKing it with the owner who presumably assumed they had bought the content (Amazon was nice enough to refund the price of the book though). However these were not just any books. As if they needed to make the threat of this type of capability more obvious they removed Orwell’s dystopian novels “1984” and “Animal Farm”. It should be pointed out that this was not fully Amazon’s fault. The ebooks in question where actually sold illegally by a company that did not have rights to do so. However I feel strongely that this is not an excuse for removing purchased content. People bought it. They have it now. You screwed up by selling it to them. And independent of all, this it is now clear that they have the capability to do this sort of disappearing act. So I am happy I am not connected to their network. And I feel a bit vindicated. When I was young I knew a guy who played the lottery a lot and firmly believed that his odds were higher if he put his money on numbers that had not come up in a long time. In other word he thought random systems tend “catch up” to become balanced, but this is of course totally fails. Random systems are only balanced over an infinite sample. Before I go any further I should note that I am not an expert on any of this stuff. I don’t know much about the theory of randomness or the methods of it’s creation. This is just my own thoughts. A lot of people seem to have strange ideas of what “random” is. For instance, look at the Dice-O-Matic built for GamesByEmail.com. It is a mechanical dice roller and is a really fun project BTW. I don’t mean to put it down at all with this post, I just don’t really understand why people would like it is better than a computer based random number generator (true or pseudo). It was built because users of the site complained that the computer generated dice rolls where not random enough. The sources he used were standard pseudo-random number generators and also true random number generators like random.org. PRNGs are certainly not random but over the sample size used on board games it seems very unlikely to me that anyone could detect the non-randomness. And if you introduce something like random.org you have random numbers generated by such a huge system (the earths atmosphere) that they would almost certainly be more random than dice rolling on a table (especially the cheap dice that come with most games). My suspicion is that people felt like they were getting too many low rolls. But that happens in random systems. Anything can happen; that’s what random means. Here are instuctions for building a small device that detects the alpha emitions from a sample of americonium (from a smoke detector): Alpha Radiation Visualizer. The output of this will be very random (the radiation is a quantum process). Here is a chaotic circuit that can be sampled to produce random numbers: Make your own True Random Number Generator 2. This TRNG is not quantum (I don’t think) but it is highly chaotic and should be a good source of random bits. [EDIT] There is also LavaRnd. Which looks much better designed than any of the other ones I mentioned. Though I think either of the above hardware devices could be used as good input into the LavaRnd algorythms.